Twenty years ago, when The Sopranos first aired, some viewers may have initially thought they were going to see a show about opera singers. However, when they watched the complicated New Jersey mob family led by larger-than-life character Tony Soprano (portrayed by the late James Gandolfini) they were captivated by the stellar performances and the polished writing that made for great character development. The HBO series ran for six seasons for a total of 86 episodes and it is widely considered one of the greatest television programs of all time. In fact, the show won 21 Primetime Emmys, five Golden Globes and countless other awards. It has been the subject of critical analysis, books, a video game and other assorted merchandise. Although Gandolfini, a Rutgers alum who grew up in the Westwood borough of Bergen County, passed away in June 2013 at age 51, putting an end to hopes of a television or film sequel, there is a great deal taking place to keep the monumental legacy of The Sopranos very much alive. Gandolfini’s son Michael will portray the younger version of the iconic mafia leader in the upcoming film The Many Saints of Newark, written by the show’s creator, David Chase. Dominic Chianese, better known as Uncle Junior, will not be part of the new film, though a younger version of his character very much will be. Nevertheless, he’s looking forward to the final product, which has a tentative September 2020 release date set. “I think it’s a great idea and I am very happy for David [Chase], that he is writing again. He is a wonderful writer, and I am looking forward to seeing this movie,” Chianese says. In keeping with the family theme, Chianese is currently starring in The Village, a new drama that debuted on NBC in March about the close-knit residents of an apartment building in Brooklyn. The 88-year-old Chianese plays Enzo, who is grappling with issues surrounding old age. Adding to The Sopranos fever, Steve Schirripa (Bobby Baccalieri), is teaming up with Imperioli and Vincent Pastore (Salvatore Bonpensiero) for a new tour that recently kicked-off at the Borgata in Atlantic City. The show, Sinatra Meets The Sopranos, includes Sinatra tribute artist Michael Martocci and Sinatra band members, and it’s an opportunity for music, musing and audience participation to feed that apparent never-ending hunger for everything and anything to do with The Sopranos. We took a walk down memory lane with Schirripa to talk about the show’s undeniable legacy, what life is like when it’s all over and how the tour came about. 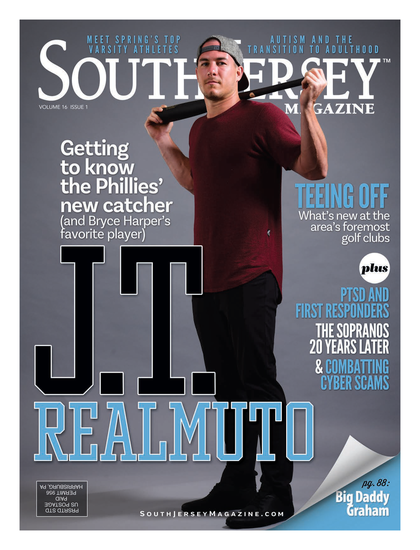 SOUTH JERSEY MAGAZINE: Why do you believe The Sopranos had such enduring popularity and connected with audiences in such a huge way all those years? STEVE SCHIRRIPA: I think back then the mob was like the modern-day Western. Years ago, people loved Westerns and that seems to have tailed off. ... The character of Tony Soprano had resonated with people because it was one of the few times you saw a mob guy at home with his kids and with his problems. So, I think people related to that guy. Even though he was a murderer and a bad guy and did a lot of bad things and he hurt people and killed people, you were still rooting for this guy somehow. SJM: What can you say about the 20th anniversary of The Sopranos and what this means to you? SS: I was an actor before the show, but I was not doing it full-time. So, The Sopranos was my first real acting job. At first, you do not realize it when you are involved, but then you take a step back and see how many people all over the world recognize me wherever I go. SJM: That surely says something remarkable about the reach of the show. SJM: What was the idea and inspiration that led to Sinatra Meets The Sopranos? SS: We have been doing a bunch of these question and answer gigs for years, with different cast members. Sometimes I would be with Tony Sirico (Paulie “Walnuts” Gaultieri) and Lorraine Bracco. Then Michael [Imperioi] approached me and asked what I thought of doing this show, since a majority of our fans cross over with Sinatra’s fans; and it has worked out really well. It’s a night of nice music, and if you’re a Sopranos fan and you want to ask a question, you want to find out things that we haven’t said publicly, but just a little peek behind the curtain I think you’ll have a good night, and then people can come backstage and say hello. SJM: What else are you working on? SS: I’m mostly working on the CBS show Blue Bloods with Tom Selleck. I have been on that show for four years and I have shot more Blue Bloods episodes than Sopranos episodes. SJM: What do you see when you look in the mirror? SS: I see a guy that hopefully is a good father and who has worked very hard. I’ve been working steadily so that makes me extremely happy. So, yes, I see a good guy.